Part one of an essay on this remarkable musical pioneer, by the UK's leading critic, broadcaster and author, Jameela Siddiqi. published in the January 2004 issue of veena Indian Arts Review. He arrived in the West at a time when Europe stood on the threshold of the First World War, the after effects of which were to leave western society permanently and irrevocably changed. European wars and politics were to touch his personal and professional life in many different ways. 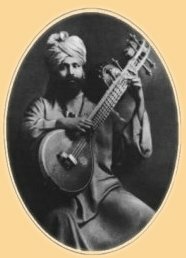 Inayat Khan was able to observe the impact of nationalism and jingoism at first hand and while the First World War offered a backdrop against which he was able to perfect his groundbreaking theories on the mysticism of sound and music in terms of discord and harmony as represented by warlike nationalism, while his daughter, Noorunissa, many years after his death, found herself in the midst of the Second World War as a heroine of the French Resistance movement, and was eventually shot by the Nazis. In today's India, unless you specify you mean 'Sufi' Inayat Khan, it is generally assumed that you are referring to one of the two other eminent classical musicians of the same name. The vast repository of textbooks on Indian classical music make absolutely no reference to Hazrat Inayat Khan who was, undoubtedly, not only one of the greatest musicians of his time, but had also composed poems in Farsi, Urdu and Hindi. These recordings, made on 78 r.p.m records lay neglected in mint condition within the EMI archives in London for some 90 years! Some amazing detective work, carried out by the Australian scholar Michael Kinnear in 1994, uncovered the entire collection of 31 songs recorded by Inayat Khan during his stay in Calcutta in 1909. On hearing these recordings and Inayat Khan's full-throated ghazals, khayals, taranas, bhajan and dhrupad, one cannot help but realise that this is the real thing. In India itself, Inayat Khan's name in connection with classical music seems to have lapsed from local memory once he left for America in 1910. While that is understandable, what is really surprising is that Inayat Khan's most important publication on music, Minqar-e-Musiqar (Allahabad Indian Press, 1913), one of the most definitive works on the theory and practice of Indian classical music (including full delineations of some 450 raags! ), has never ever been translated into English or any other language, given the vast demand overseas for authoritative works on Indian music.